Imagine my surprise and delight when I discovered a hair mask that left my locks so soft, so sleek, so unbelievably lush ... and in only five minutes. "Impossible!" you say. "It can't be done!" But it can, thanks to Klorane Hair Mask with Papyrus Milk. Now, normally my hair is quite dry and unruly. Luckily, that's exactly what this mask works to fix! It contains botanical milk from the Cyperus Esculentus plant -- a perennial plant of the papyrus family -- which restores moisture to tresses with a unique combination of fatty acids and polar lipids. What does that boil down to? Lustrous, reinvigorated locks that remain shiny and bouncy for days on end! The mask itself is rich and thick. It smells slightly of cucumbers, which is interesting as it's a pale seafoam green! And while other hair masks require huge scoop after huge scoop to make my locks manageable, I only needed a quarter-sized amount of this one to cover my entire head and make my hair soft almost immediately. Left on for only three minutes, it rendered an application of conditioner completely unnecessary and made for a supremely excellent blowout. All in all? This little tub has become quite the miracle worker in my shower. 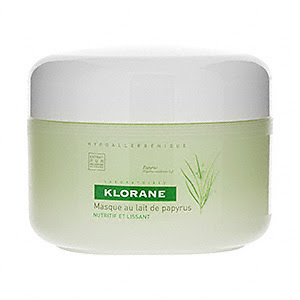 Klorane Hair Mask with Papyrus Milk retails for $24 at drugstore.com. I am so glad that I read this blog, my hair is very dry and quite damaged from lots of straightening and I am always on the look out to find products that will help make it better. After reading this I think that I am going to have to give Klorane's hair mask a try!